Cold and dry was the prediction for the winter of 2013/2014 and it seems that they were correct. 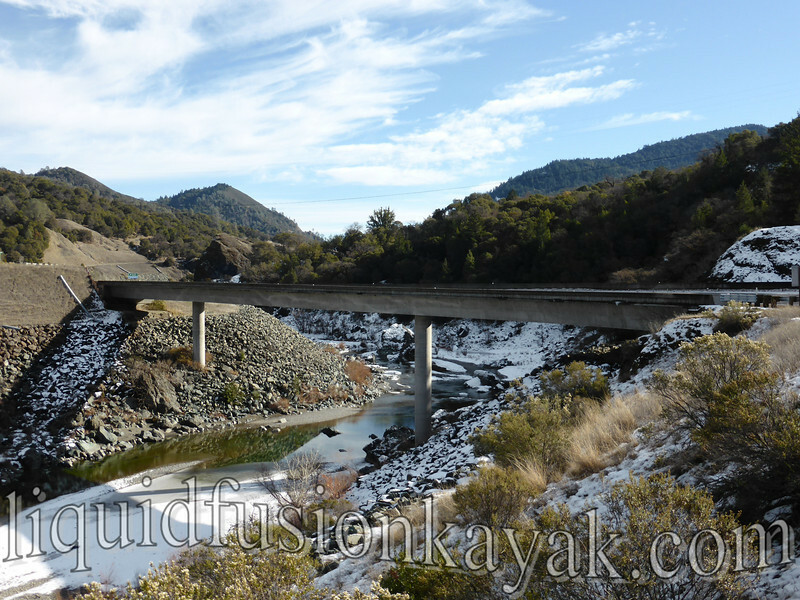 Over the weekend, Jeff and I did a scouting trip to the Eel River. 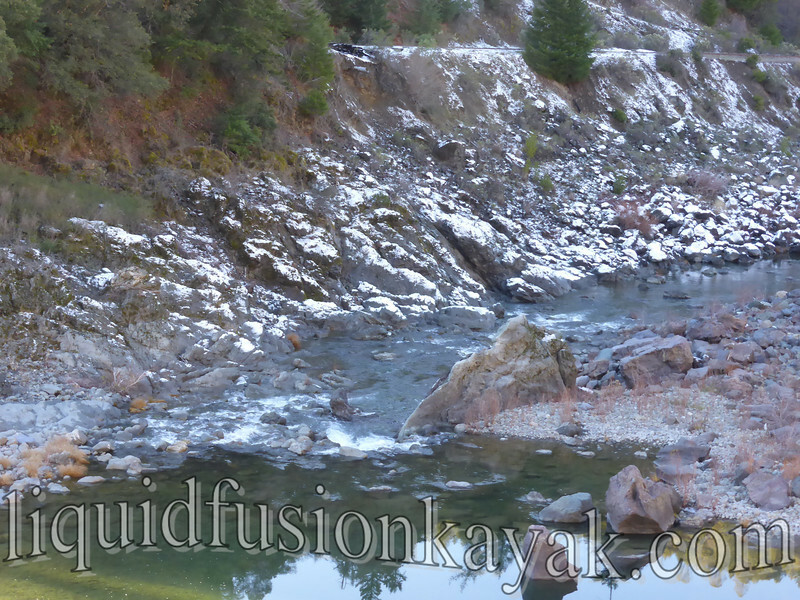 We were preparing for a swiftwater safety course and expected the river to be low but weren't expecting snow. We saw at least 20 salmon. 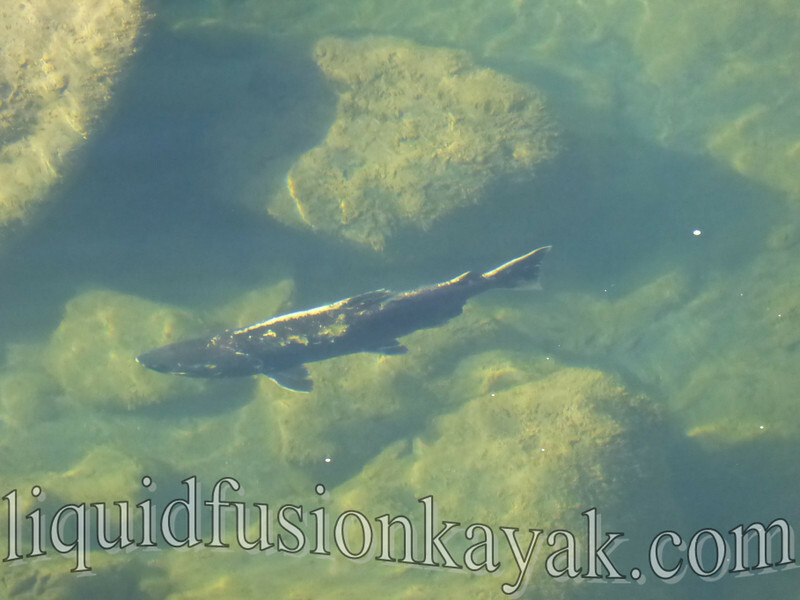 Some were spawning and others were waiting in pools before traveling further up the river. We can only imagine what a rocky journey it has and will be with very little water in the river. 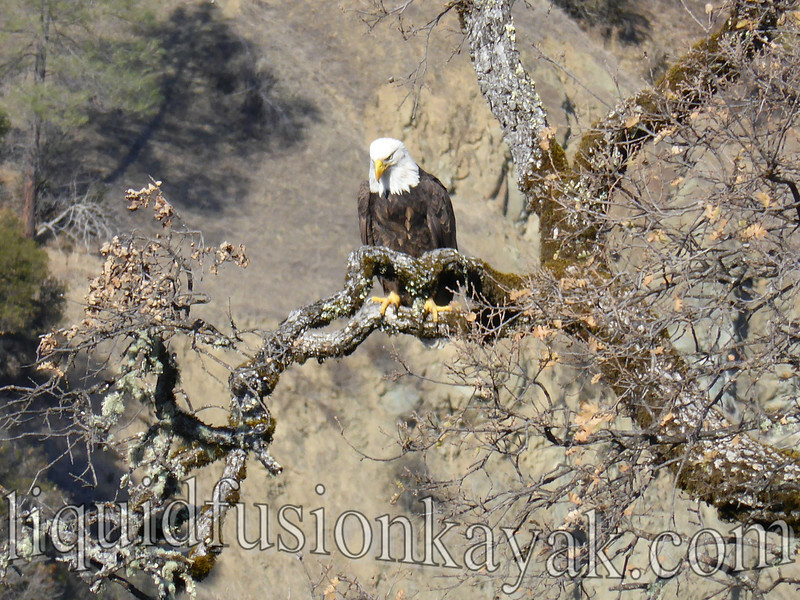 Bald eagles were plentiful along the river. They like salmon too. 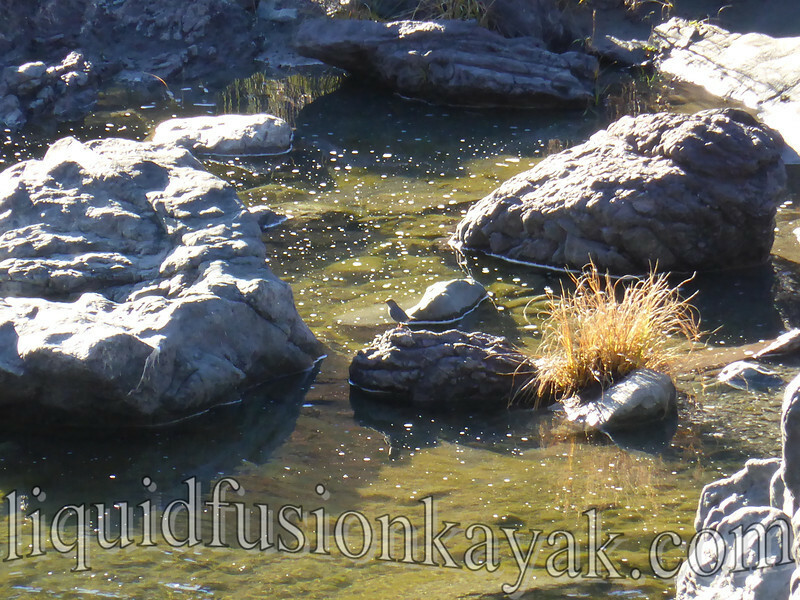 We enjoyed the familiar sounds of the American Dipper and watching them zip about and dip into the chilly water to feed. While this wasn't the winter wonderland (or perhaps we should say playland) that we were looking for, it sure was beautiful and we enjoyed it. Carpe diem! 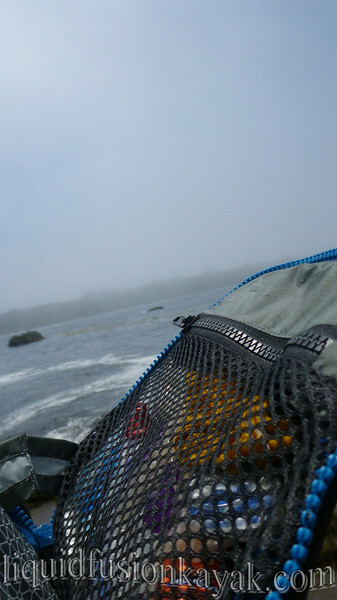 Here's a link to more of photos from our traipse about on the Eel River. This spring, Jeff ordered the new 2013 Astral Green Jacket. It turned out to be too small for him. His loss - my gain (besides blue and black are more my colors than his). The Astral Green Jacket is a Class V US Coast Guard approved rescue life jacket. The new Green Jacket has many of the features of the old one with a few changes. The most noticeable change being the clam-shell pocket. The clam-shell pocket on the front is AWESOME! As a guide, there is a lot of gear that we need to carry. I can carry much of what I might need immediately on my person (first aid equipment, communications, camera, knife, snacks, sunscreen, ect.). I know other boaters that carry their pin kit on them in the jacket. 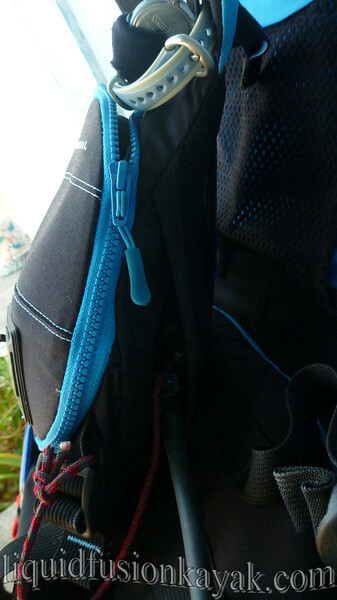 The side pockets aren't as easily accessible but are other good places to stash gear. I keep a neoprene beanie in one of them for extra warmth for me or my students. The Green Jacket is comfortable. Astral's techtonics allow the upper portion of the jacket to move with your torso independent of the bottom. Unfortunately it makes most other life jackets feel like straight jackets. The Green Jacket is a beefy jacket with lots of protection - not something that the everyday paddler wants or needs. The protection is there for those of us who need rib and spine protection from rocks, boats, flailing students paddles, ect. It also has the integrated rescue harness for rescue scenarios - again another feature that many paddlers don't want or need. 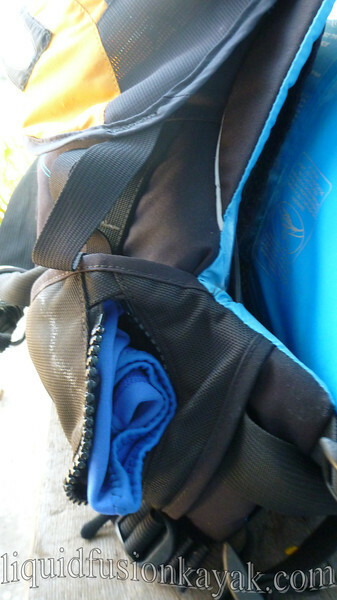 We recommend taking a swiftwater training course before using a rescue vest with harness. The harness on the Green Jacket is secure and has served me well in rescue situations including quick tows in rock gardens. 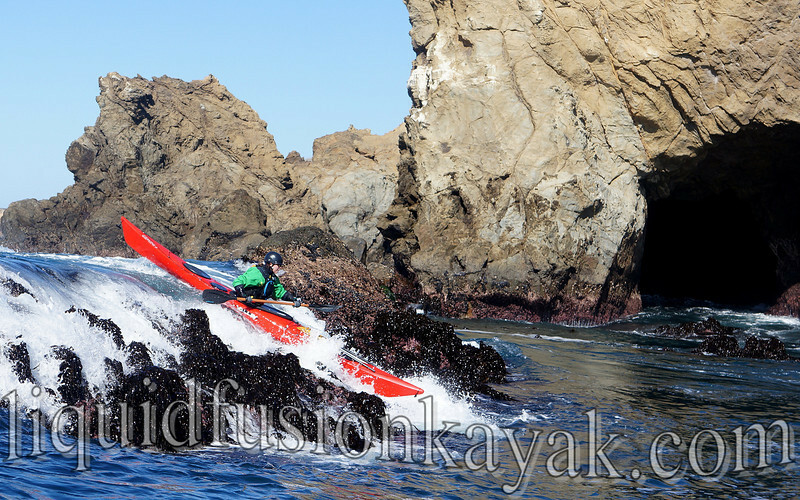 I would not recommend that sea kayakers rely upon this as their primary tow system (a topic for another blog). The Green Jacket is a deep (long) jacket that might not work for those with shorter torsos. 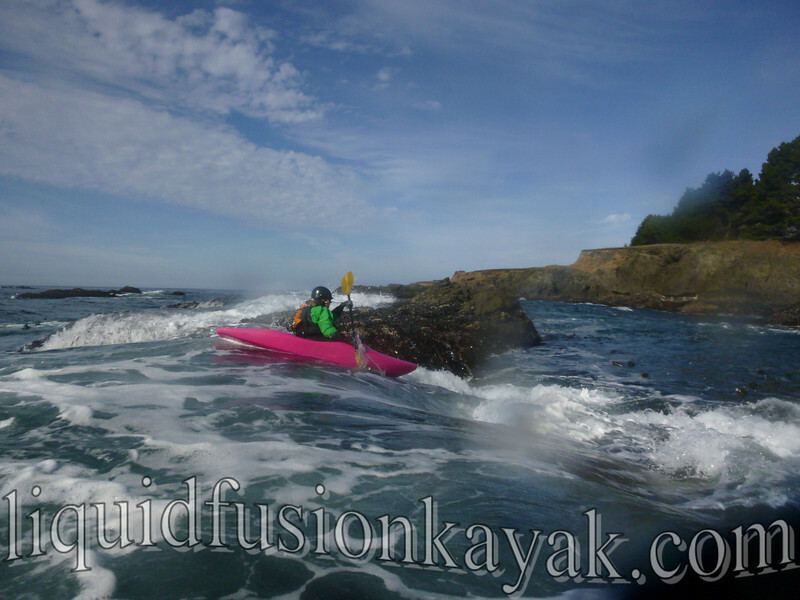 I find it cumbersome when I have to hop into one of our deeper/larger volume sea kayaks. It is also has a lot of bulk in the front with the flotation panel and clamshell pocket. I initially thought this would be bothersome but find that I only notice it when I am demonstrating certain deep water rescue techniques (cowboy scramble and heel hook). The handwarmer pouch is a nice touch and gives you a place that is not only fuzzy, warm, and out of the wind for your hands but also a place to quickly stow items - like gloves when launching or doing rescues. I have even stowed my towline in the handwarmer pocket situations when I needed to stash and dash (of course repacking it later). Another nice feature of the Green Jacket is the pocket behind the clamshell. It was designed so that paddlers could carry a throw rope on them. I haven't tried this yet but have found it to be an accessible and secure place to stow my marine radio (tethered of course). Overall, I would highly recommend the Astral Green Jacket for whitewater kayakers looking for a rescue life jacket. Paddlers who are my size (5'4" and 120#) or smaller, should definitely try it before buying it - in particular making sure that the depth of the jacket does not interfere with their paddling. 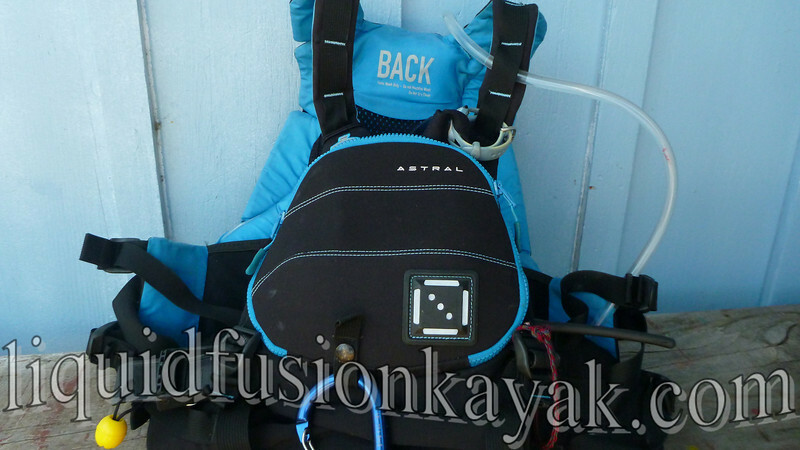 Sea Kayakers should consider Astral's SeaWolf which is a very similar jacket with the added features of side entry and the option of adding a rescue belt. PS Astral's customer service is outstanding. They are staffed by a bunch of paddlers who know paddling and care that their stuff fits and works for paddlers. 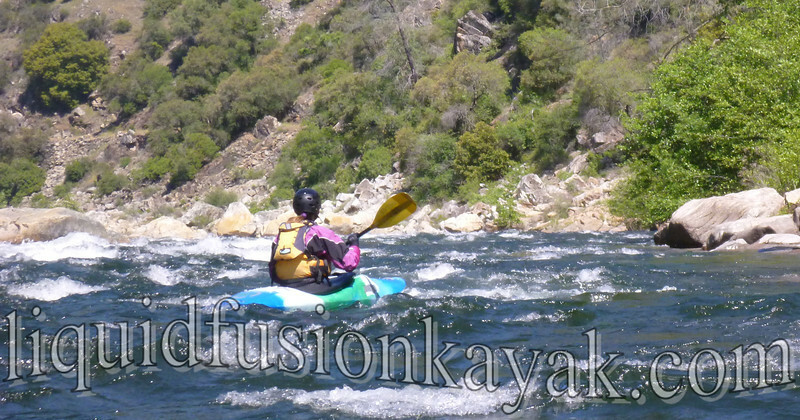 Goldilocks has found the whitewater river runner kayak that is "Just Right" - the Jackson Zen 55. The promo video showed a fun, capable river runner, but I wasn't excited until I saw the specs (I am a bit of a numbers person). The Zen 55 is listed as 7'11" long and 24" wide, 60 gallons, and weighing 36 pounds. The specs would lead one to think - a fast, lean boat. I could get excited about this but was a little skeptical that it might be too narrow for my hips like many of the kids' whitewater boats. The Zen 55 looked like the right size. True this is a very subjective statement but having paddled many different river runners over the years and looking at others, they always look too big. My fear that the Zen 55 was a kids' boat was alleviated when I sat in it and fit. It fits like my favorite pair of jeans. River Running - The Zen 55 danced on the water for me as we boated the Chili Bar Run of the South Fork of the American River. The boat continued to feel like my favorite pair of jeans and moved with me - where and when I wanted to. The planning hull carved into and out of eddies and glided nicely on waves. The hull was sporty and playful yet stable. I liked the way the boat rode through the wave trains. The volume felt well balanced and the handling was very predictable. Rolling -The Zen 55 was easy and effortless to roll. This may have been one of the easiest boats that I have ever rolled. Ocean Rock Gardening - A day rock gardening and surfing in the ocean on the Mendocino Coast reaffirmed my thoughts that this is a great river runner. 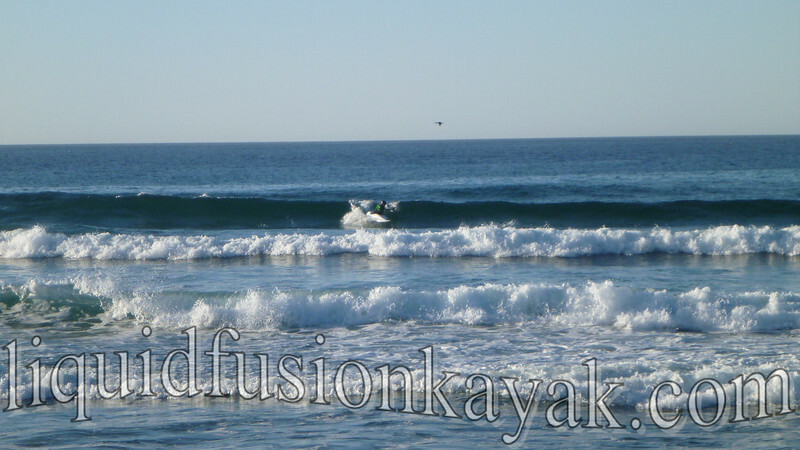 For this type of paddling my craft of choice has been a Necky Jive because it is fast and surfs well. 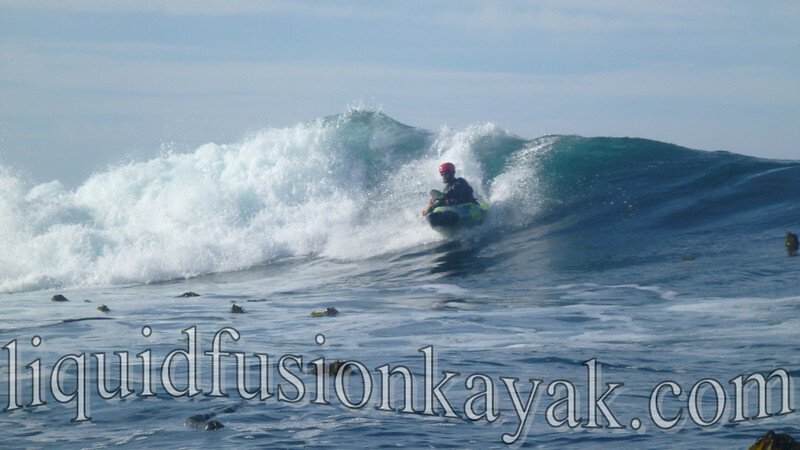 In the Zen 55, I continued to have that solid body boat connection and was able to maneuver the boat and make directional changes when riding pour-overs. I also really appreciated the Zen's volume for predictable resurfacing from holes. I'm not sure about the Zen 55 on an ocean wave yet. As expected the Zen 55 was slower than the Jive, and the stern volume was a bit contentious when caught by the foam pile. More work and testing on this to come. 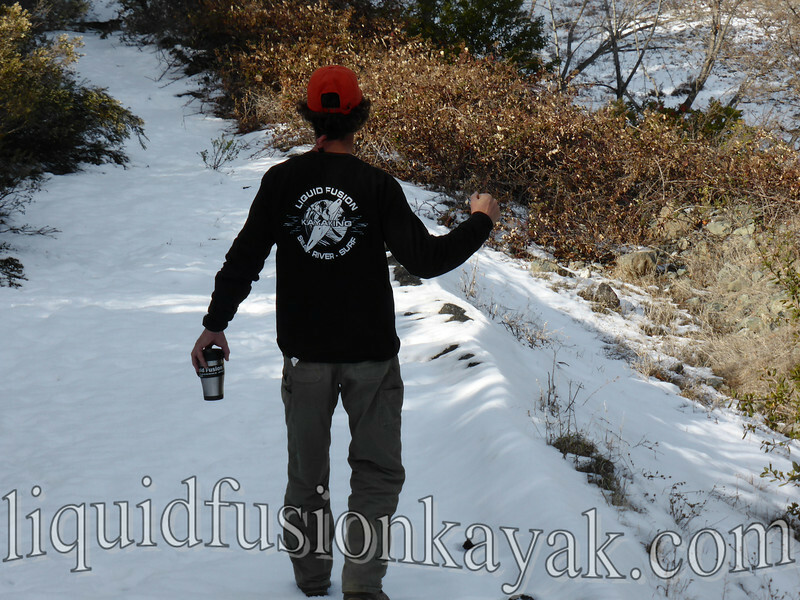 Outfitting - The outfitting is easily adjusted and comfortable. Obviously Jackson Kayaks have put a lot of thought into outfitting. Here's a link to all the features of their outfitting. 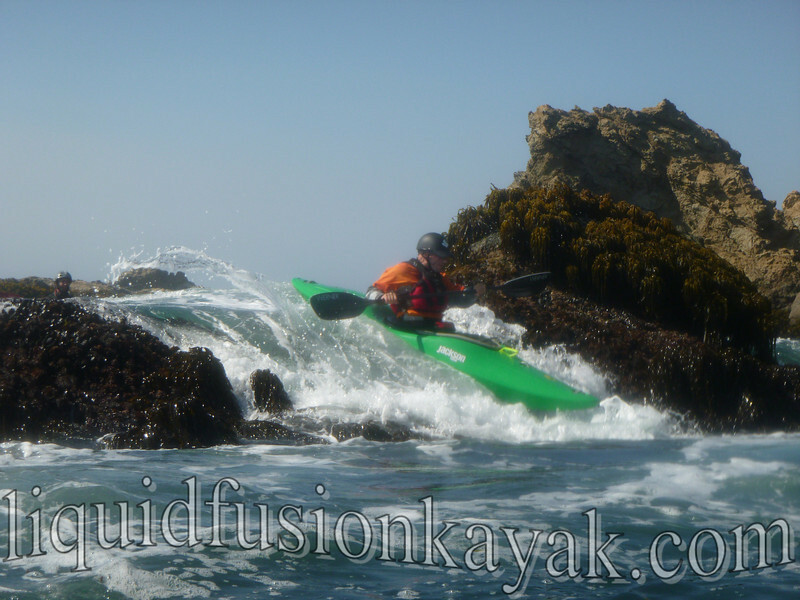 I appreciate that there are no ratchets to corrode and bulkhead adjustments are simple and even possible to adjust on the fly with Jackson Kayak's corded system (no more crawling in kayaks and wrestling with the adjustment brackets on bulkheads). Footrest/bulkhead adjustable from the seat of the kayak with one pull on a rope. The smaller cockpit size of the Zen 55 is really nice compared to other river runners. It makes for a more comfortable body/boat connection. The shorter cockpit length makes it so that smaller paddlers can use drier, more implosion resistant spray decks without having a wrestling match to get them on. The original position of the backband is way to high for my liking so I re-routed the adjustment cords so that it would sit lower. The foot room is ok in the boat for me in my booties but too tight in my Keen Gorge Boots. This is not an uncommon problem and one that I will solve by carving out notches for my heels in the center pillar. 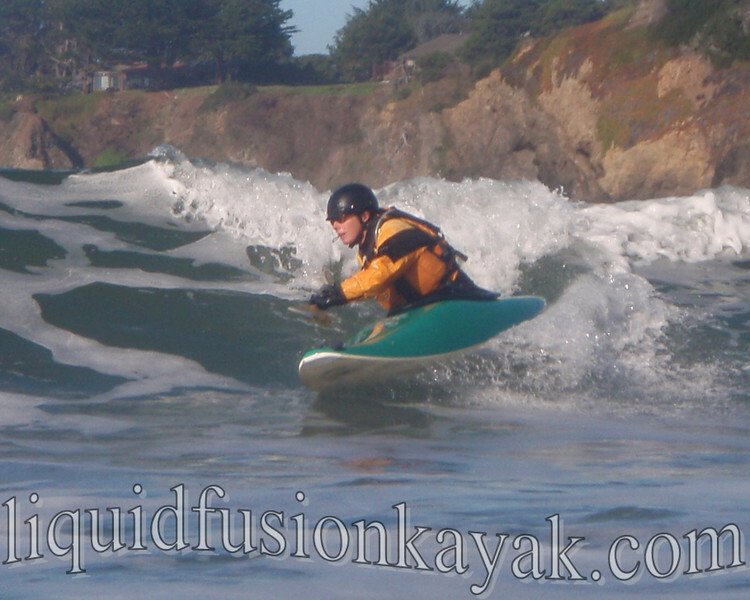 Other Sizes - I have not seen other paddlers in the Zen 55; however, quite a few of our students have been paddling the Zen 65 and 75 on the river and in our Whitewater of the Sea Adventures (ocean rock gardening). Both Jeff and I have been amazed at the beginner friendliness of the Zen - stable, maneuverable, fast, and easy to roll. Jeff has become a huge fan of the Zen too. Here he makes the Zen 75 sing on an ocean wave. Would I recommend the Jackson Zen 55? YES!!! My favorite thing about the Zen 55 is that it is fast and responsive. The design and outfitting are well thought out and work for a smaller paddler. For me, it handles like a performance sports car instead of the ho-hum Toyota Camry feel of the other river runners that I have paddled. Even though it is sporty, the Zen is quite stable and confidence inspiring. 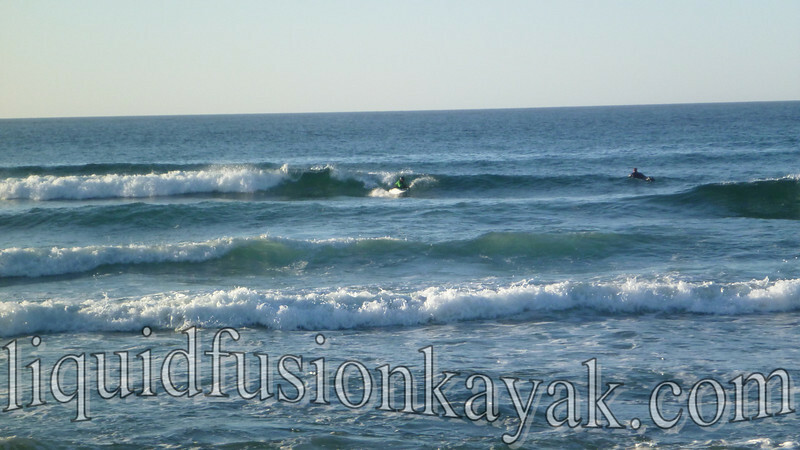 The Zen's edges will carve into an eddy or on a wave but aren't grabby in chaotic water. It is predictable and fast for making moves and super easy to roll. For those looking for an easy to roll, beginner friendly boat for learning to whitewater kayak, the Zen is it. The Zen is stable, maneuverable, fast, and easy to roll. 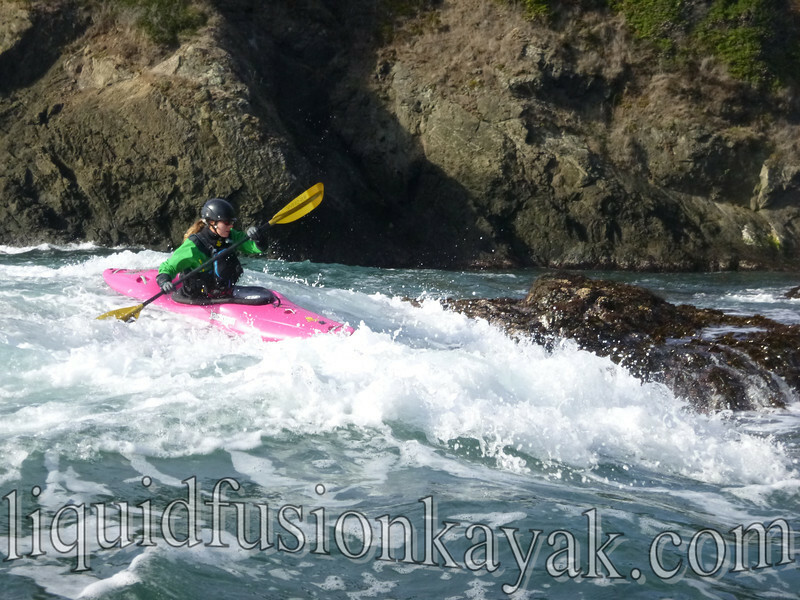 The Jackson Zen is the first whitewater kayak that comes to mind when students ask for recommendations for a river runner or ocean rock garden kayak. The Jackson Zen is also a very capable performance craft for river running up to class IV and playing in ocean rock gardens. I am at the top of the weight/size recommendations for the Zen 55 which is probably why is it such a sporty kayak for me. If you are taller than 5'4 and/or over 120 pounds, you might want to try the Zen 65. I have sat in our 65. It feels too big but will paddle it and share my thoughts - if I can tear myself out of the 55. These are my overall impressions of the Zen. Fortunately the Zen 55 seems to fit the hard to fit smaller paddler but also there is the 65 and 75 to accommodate a wide range of paddlers. If you are in the market for a river runner, definitely check out the Zen. If you have experience with the Zen 55, please share them with me in the comments below or send me an email. Do you ever see athletes in action and admire the grace and fluidity of their movements? They make it look so easy that we often forget the hundreds and hundreds of hours that they spend working to train their bodies and minds. Movements that are seemingly effortless really have taken considerable amounts of effort to become effortless. 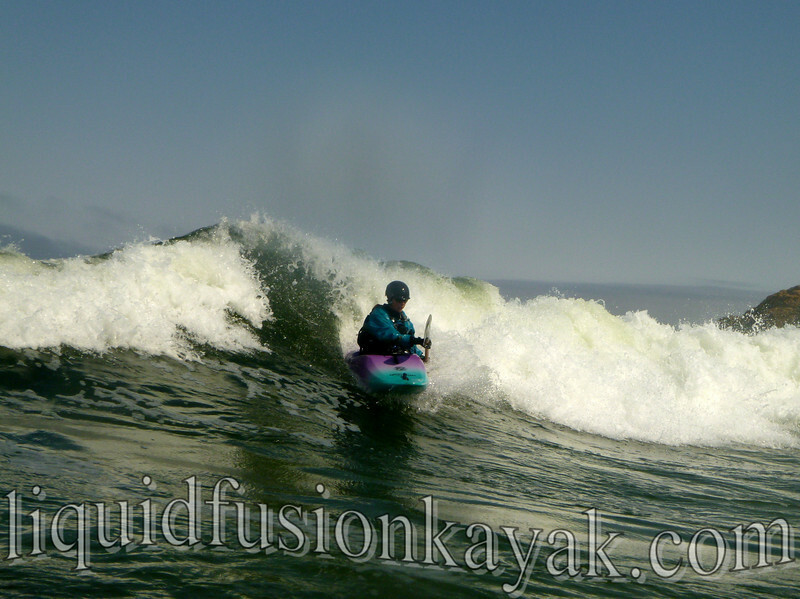 When I started paddling in 2007, I wanted to surf ocean waves. I watched Jeff and others. I admired the beauty and grace of their movements - how they danced on the waves. Of course being an analytical thinker, I studied their movements. I analyzed the specific components of how they surfed - wave selection, where they caught the wave, strokes that they took to get onto the wave, and how they maneuvered on the wave. It helped that I had my own personal coach as well. Buy him a tasty beverage after a surf session, and he would answer my endless questions. 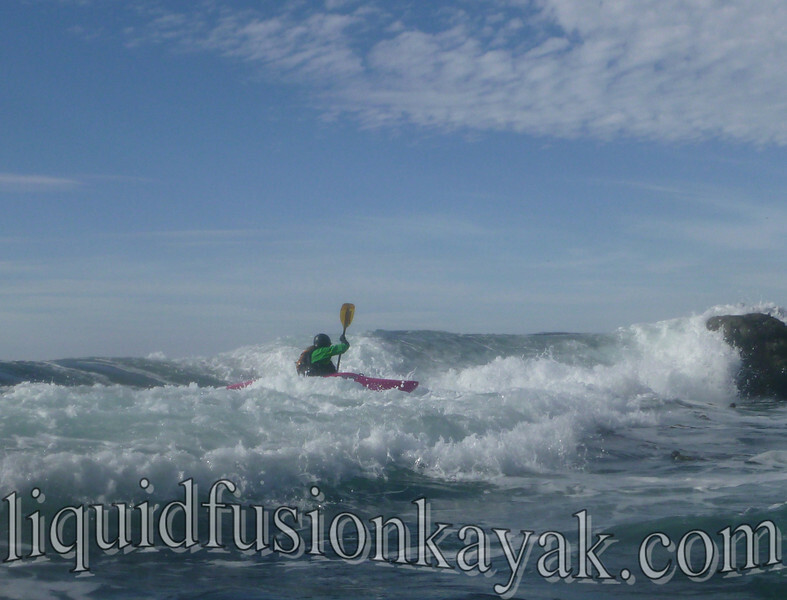 I was sidelined with a non-paddling injury for much of 2008 and again subjected to watching and learning. 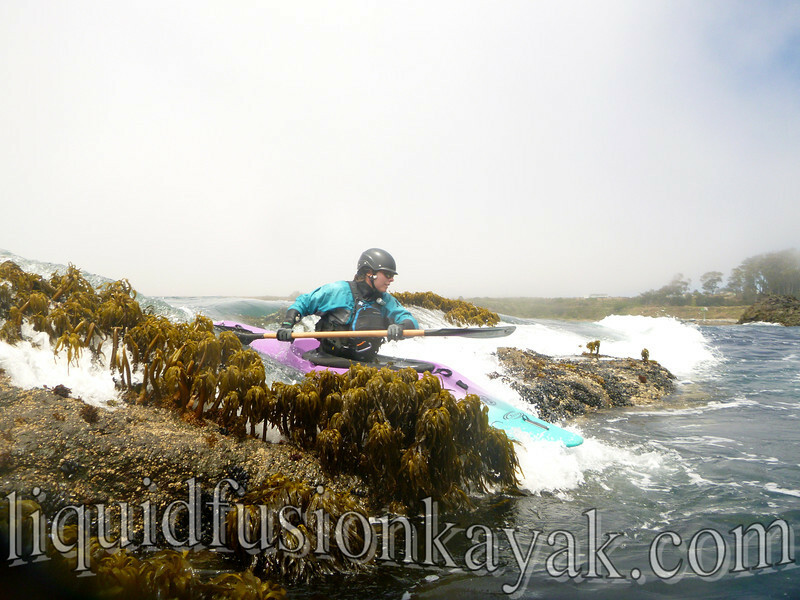 In 2009, I focused on dialing in my boating skills - strokes, bracing, rolling, controlled launching and landing in the surf, and rock gardening. 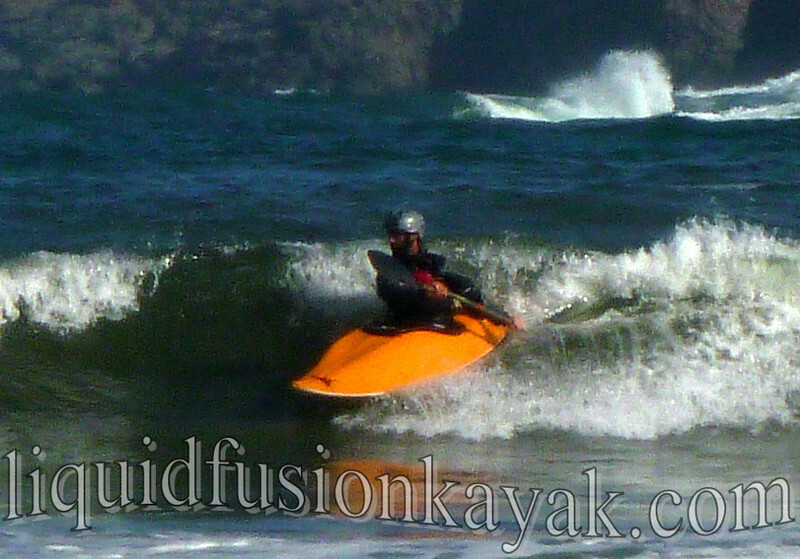 In 2010, I started to surf kayak. 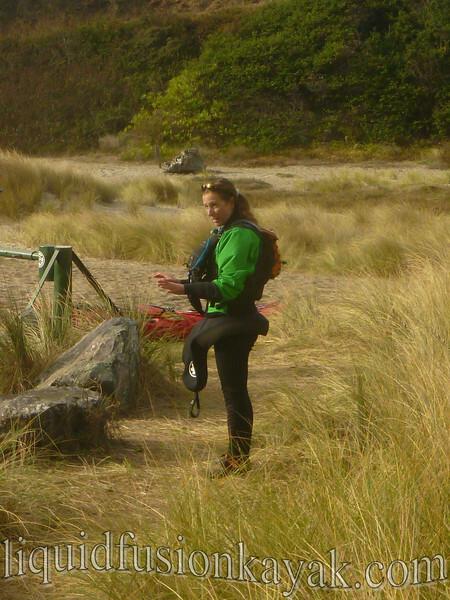 From rock gardening and controlled surf zone drills, I developed a reliable roll in dynamic water and an understanding of the pulse of the ocean and the surf zone. A Mini-Mako that had been in our stable became my steed for the surf zone. It was my first waves with the Mini-Mako that I felt the speed and elation of flying down a wave (admittedly it was probably a 3' wave). 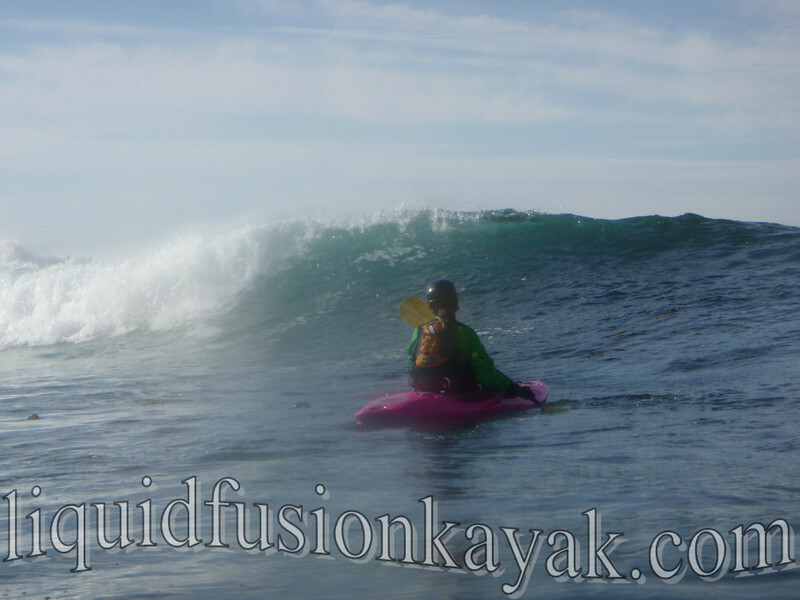 While I had some magical experiences with the Mini-Mako, it was surfing the Necky Jive that gave me the confidence to drop in on steeper waves, to learn control of my shore side edge, and to rudder on my shore side. The Jive really does auto plane on to a wave, but then it is the surf pilot who makes it dance there. Fast forward to 2013, I am starting to dance on the wave. I continue to enjoy the challenge of the puzzle of figuring out our local shore breaks and am gaining the confidence to drop in on our local reef breaks which can extol penalties in pain and broken boats for mistakes. I don't want the adrenaline rush of surfing big waves. I want to dance on the wave - climbing and dropping, cutting back and flirting with the foam pile, floating off the top of it, and racing down the line to make the next section. I continue to develop my skills in the Jive, but we decided it was time for me to move into an high performance surf kayak. October 2013, a Valley Rush 2 joined our fleet. Day one - I was thankful that I didn't swim. I spent a lot of time upside down and missed more rolls in one session than in a couple of years of boating. The reality that this is a big step hits me, and I have the choice to give the boat over to Jeff or to buckle down and learn to paddle it. Day two - a few outfitting changes and I am comfortably rolling it. Now determination has set in. I am going to learn to surf this boat. I set up a training schedule for myself. Day three - I am starting to fly down the face of waves. Despite tripping over my edges, the elation of flying down a wave boosts my spirits and gives me the confidence that I can learn to do this. I am starting to have fun. Day four - I am flying down the wave and almost outrunning it then starting to make the boat move around. 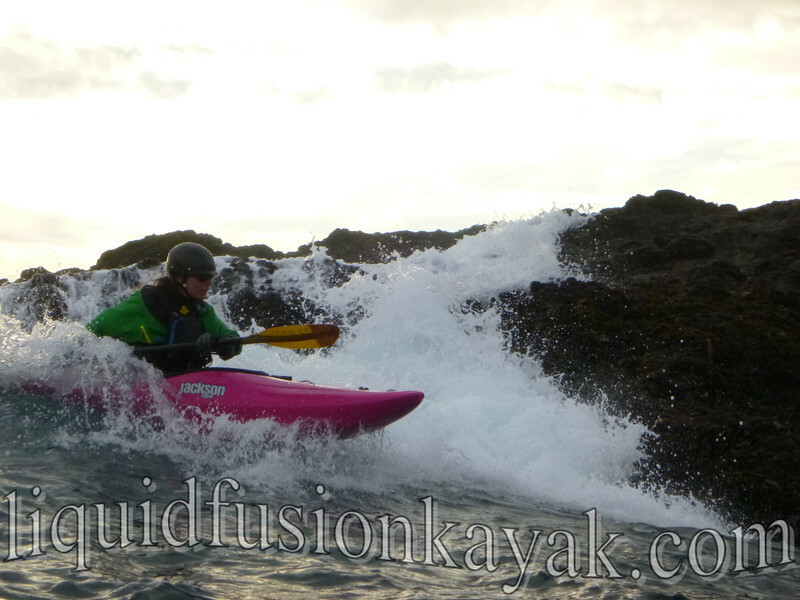 The Rush 2 is so responsive - there is a reason why it is the boat of choice of many of the best surf kayakers in the world. Day five - I finally feel like I am surfing. I have miles to go but I would venture to say on this particular day I caught better waves and had more dynamic maneuvers on the wave than the board surfers that I was out with (again one has to realize that it was a 2-3 foot day with the occasional 4 footer). Day six - I can't wait - maybe this morning . . . I share my progression for those who think that learning to surf is something that can be achieved in a class or in a first year of boating. Some individuals of course learn faster or slower than others depending upon a lot of factors. I am not a school of hard knocks type of person, and my livelihood requires that I remain injury free so I tend to take things slow and minimize risks. Also as a teacher, I understand the importance of developing a foundation of fundamental skills for injury prevention and higher skill development. The analogy that one has to learn to crawl before walking and learn to walk before running is very true. Research shows that skipping those steps in development often leads to difficulty with other skills down the road. 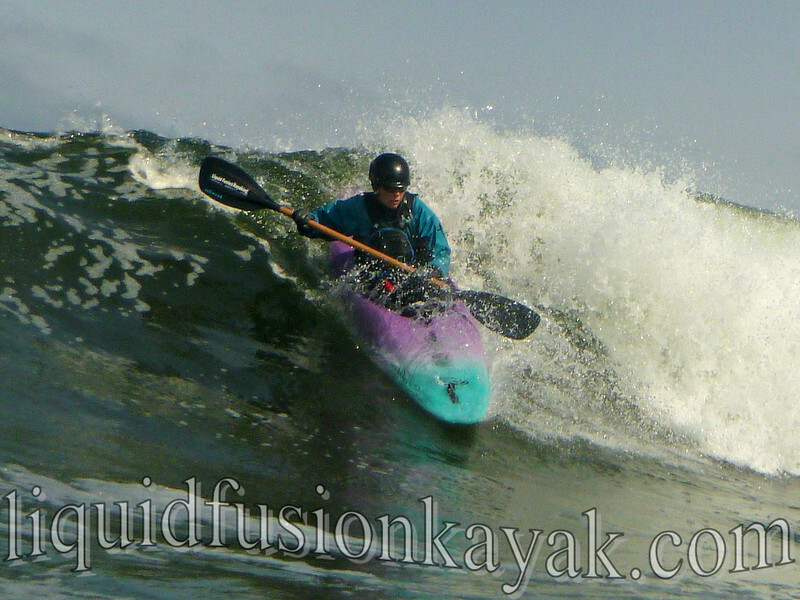 I encourage those that are learning to surf kayak to develop a solid core of fundamental skills, learn control in the surf, learn the etiquette (or don't go out where others are), practice in a location where the waves and surf vibe are friendly, and find a good coach (I am so fortunate to have Jeff). 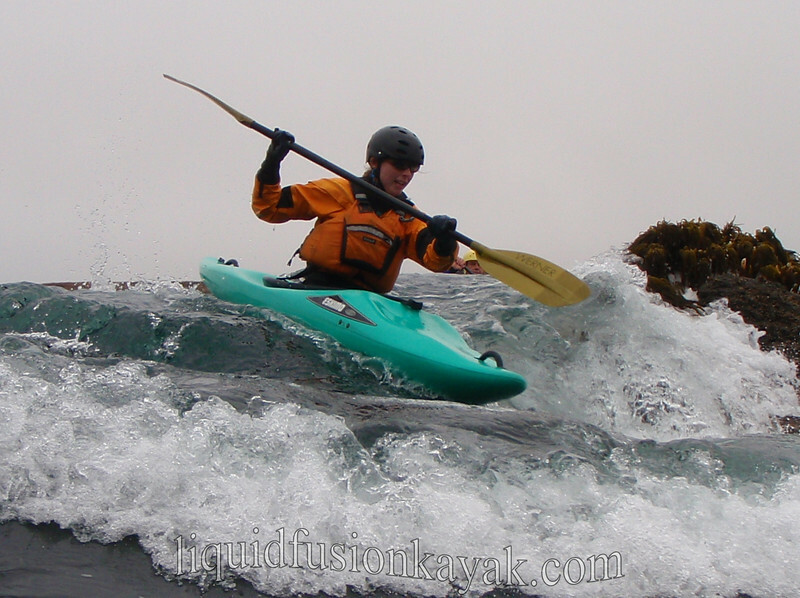 As I teach kayaking and surf kayaking, I share my learning progression for students to know where I am coming from. Both Jeff and I not only continue to hone our personal surfing skills but also our teaching skills. I can empathize with the student who is tentative about putting in a shore side rudder because it wasn't long ago I was tentative about those shore side strokes. And here I am now a little tentative about a new boat but learning to fly.